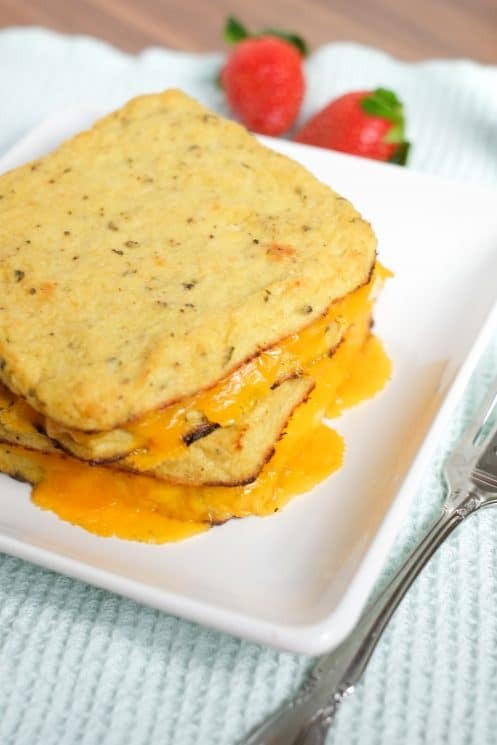 Grilled cheese gets a healthy makeover. The secret? Cauliflower “crust”! Your picky eaters may just turn into cauliflower lovers… even if they don’t realize it! A good grilled cheese sandwich is one of my favorite comfort food lunches. Something about the warm crusty bread and melty cheese just works. Mmmm. With cauliflower on our mind so much lately, we had an epiphany! 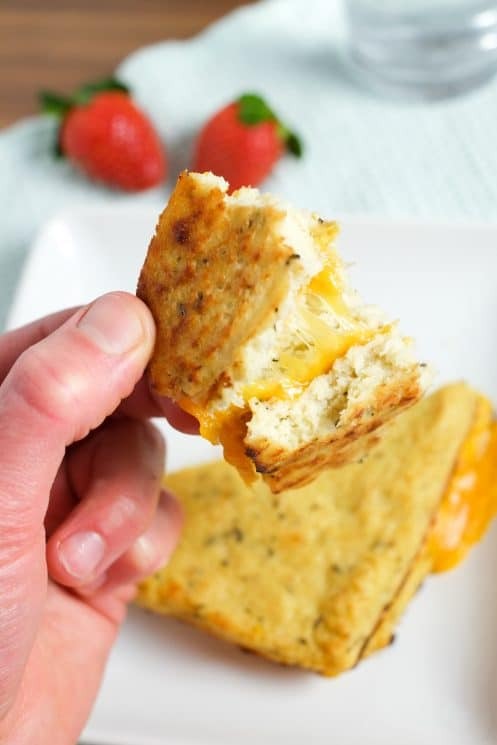 If we can make delicious cauliflower bread sticks, why not bread… for grilled cheese?! And guys, it works. It really, really works. I was skeptical at first because I worried that the cauliflower would be too wet, but when you follow these steps it turns out perfectly. You can definitely tell it’s not bread, but it’s delicious in a different way. 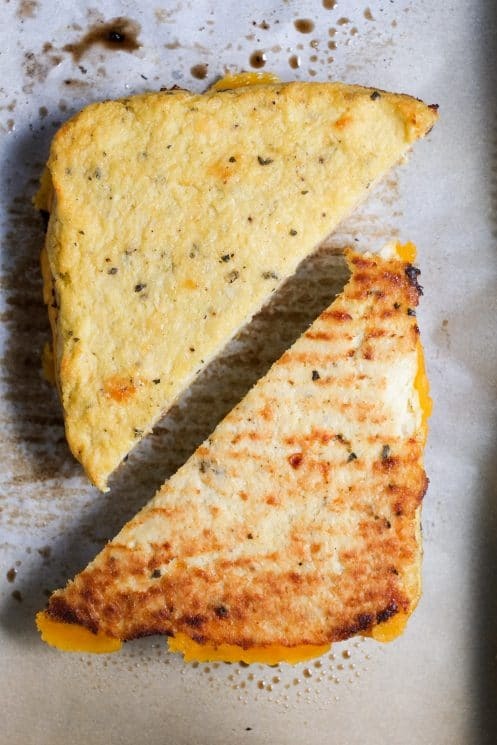 Cauliflower crusted grilled cheese is the perfect way to help picky eaters to eat some veggies. Begin by chopping the cauliflower head into pieces. 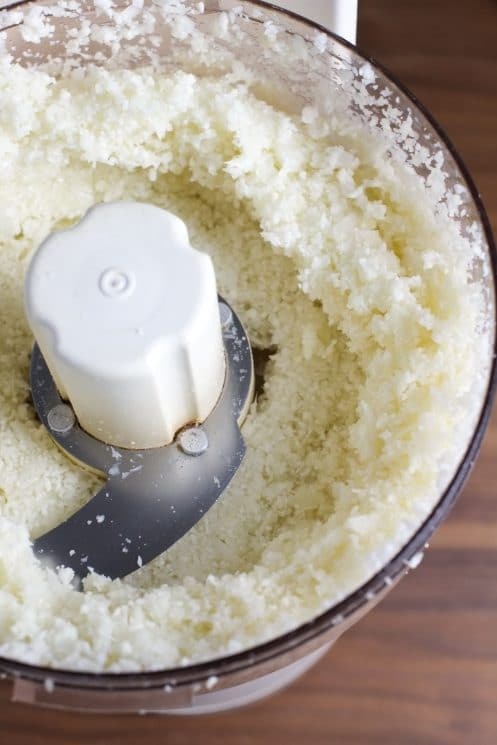 Here’s a great tutorial on the easiest way to cut cauliflower if you have every been frustrated with the process before. Once chopped and rinsed, pulse cauliflower in a food processor in batches. Place pureed cauliflower in a microwave safe bowl and lightly cover. Microwave for 4 minutes, then remove and stir. Microwave for 3 minutes more. If you prefer to cook the cauliflower on the stove instead, cover the bottom of a pot in water and bring to a boil. Add cauliflower, cover, and boil for about 5 minutes. Meanwhile, preheat the oven to 450* F and line a baking sheet with parchment paper and a bit of cooking spray. Spread a cheesecloth or clean towel over a colander. Once cooked, pour the cauliflower into the covered colander and allow to cool for a few minutes. Squish as much water out as possible with the flat side of a spoon, then twist the cheesecloth or towel around the cauliflower. Be careful because the water will be hot! Continue squishing water out by pushing with a spoon and twisting the cloth. Continue until you’ve squeezed as much water out as possible. The remaining cauliflower should be fairly dry, crumbling a bit. Pour into a large bowl and add eggs, salt, pepper, Parmesan, and basil. Mix well. 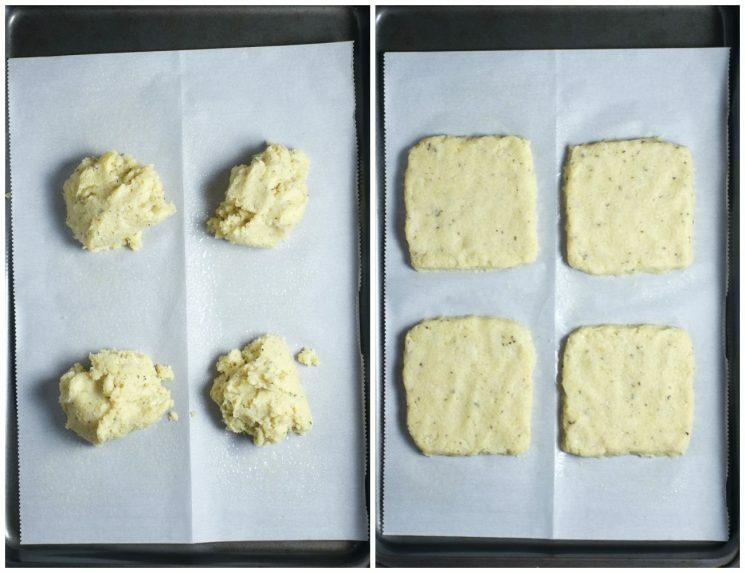 Scoop the cauliflower mixture onto the cooking sheet in four equal portions. Form into four square pieces of “bread” about 1/2 inch thick. Bake for about 15-20 minutes, until the “bread” is golden brown on top. 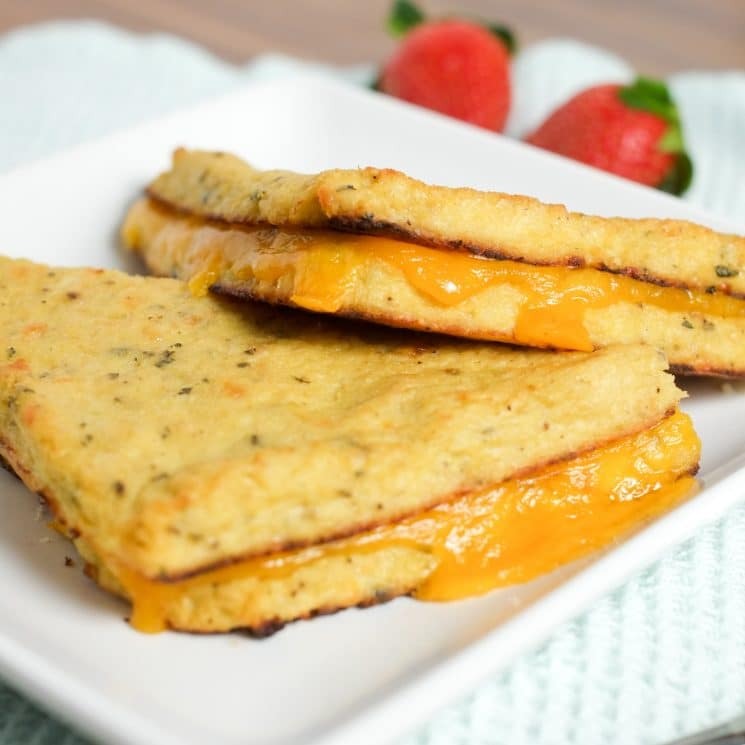 Remove from the oven and stack into two sandwiches – a piece of cheese between two pieces of bread. 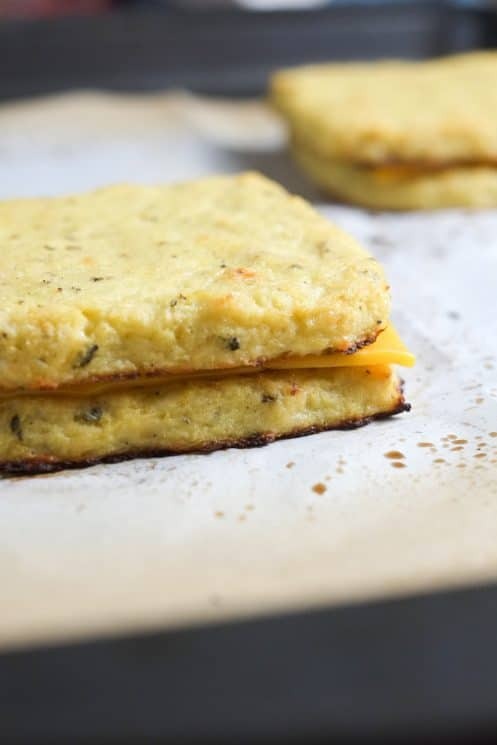 Place sandwiches back into the oven for 1 minute, or until cheese melts. These sandwiches were really satisfying! I was really impressed with how well the cauliflower worked for bread to crust these grilled cheese sandwiches. It held up and didn’t crumble or taste really weird. Definitely not wheat bread, but still delicious. Next time I’ll spread a little pesto in with the cheese, or add some tomatoes and spinach! Try out different cheeses and see which you like best. I may or may not have eaten both sandwiches myself. But hey, I just got in a whole head of cauliflower! Chop cauliflower. Using a food processor, pulse in batches until well blended. Scoop into a microwave safe bowl and loosely cover. Microwave for 4 minutes, then stir. Return to the microwave for 3 minutes. Allow to cool for a few minutes. Meanwhile, preheat oven to 450* F and line a baking sheet with parchment paper. Lightly spray with cooking oil. Place a cheese cloth or clean towel over a large colander. Pour Cooked cauliflower into cloth that covers colander. Be careful because the cauliflower steam and water will be hot. 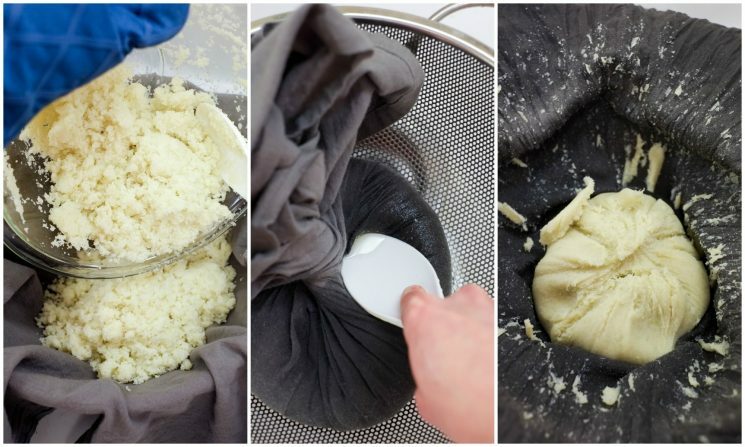 Push as much water out of the cauliflower as possible using the flat side of a spoon and twisting the cheese cloth. You’ll need the cauliflower as dry as possible. Once mostly dried of excess water, put the semi-dry cauliflower into a large bowl. Add eggs, Parmesan, basil, salt, and pepper. Mix well. Bake for 15-20 minutes, until tops are golden brown. Remove from the oven and make two sandwiches with a slice of cheese in each (thick sliced!). Place back in the oven for one minute, until cheese has melted. Serve warm. I love this! I am always looking for healthy foods for the kids. We blog about healthy foods as well! Keep them coming. Ohmigosh! Katrina, you are absolutely amazing! I am always looking for healthy food ideas (specially lunches) for my 2 and never really find anything interesting or original – until now! I think you have just found your number 1 fan! My mouth is salivating! Thank you ever so much! Can these be frozen after making and then reheated in oven ? Can these be made and frozen to have on hand? love cauliflower pizza crust, and this is a great alternative use. Wondering if you have any suggestions to replace the egg? Thanks in advance. HI, is the 318 calories per sandwich or for both? Thank you!